Interesting video. What happened to the first video? Yes, interesting ideas, especially that there are stones inside the flywheel. Others have suggested water and even mercury. Mercury is more conductive than water. Heaters use the volume change to make and break contact. Spinning a bottle of mercury, the faster it spins, the less mercury in the bottom of the bottle. If your contacts are hanging down into the bottle. The fast spin would cause the circuit to be opened. As it slows down the mercury will close the circuit and the wheel will speed back up. While the mercury switch is open you could use the wheel to charge until drag slows it down. I like it, but doesn't seem very tweekable. I'm in the market for a high amperage pulse width modulator with frequency adjustments in the 1hz or less range. Any ideas? Use a flip flop, drive power transistor's with the output of the flip-flops. Use the output of the power transistor to trigger relays. Higher capacities on the capacitor's causes a slower flop along with high resistance feeding the capacitor. I've been driving speakers with the outputs. Noticed adding weight to the speaker's causes strange effects. Guess I should post a video of the strange oscillation I get when I add weight to the speaker. Now if I could get the speaker to push/pull with the two outputs, that would be great. I think a dvc speaker is the best route. But maybe a few diodes in the right direction will allow the + to turn - and the minus turn plus. A dvc you just connect the two coils 180 out of phase. So one coil pushes and the other coil pulls. Both coils are never on at the same time. Interesting, what can of amperage can this thing handle? http://www.ebay.com/itm/222651771495 these pairs can handle 100 volts at six amps. Not sure how many amps your trying to use. I know I need to obtain some PNP power transistor's..a NPN triggered connected to a NPN will turn the second NPN off. So to drive a wheel with hall sensors that are NPN , I need a PNP transistor to turn on the coil. 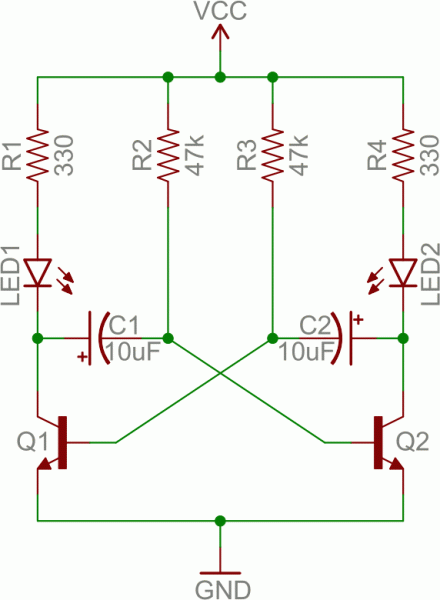 So if you build a NPN flip-flop your high power end needs PNP transistor's or relays. One NPN can turn on many PNP transistor's at the same time. Granted one transistor blows, you might lose all of them. Those LED turn lights work by the first transistor turning on, that voltage is sent to a second transistor with a capacitor, once capacitor has enough voltage, transistor #2 turns on which starts feeding voltage to transistor #3, repeating till #5 then resetting. This is the flip flop. This page shows a couple of ways to use them as switches. In the image LED 1&LED 2 would be replaced with a resistor to the base of a PNP, these PNP carry the heavy load. The resistor feeding the NPN base, use a variable pot. This will change the cycle time.less resistance, faster charge on the cap. 555 timers work good for the flip-flops, only can't handle more than 15 volts. 0.5 ma output, so is this enough to turn on the power transistor? This is where the transistor acts as a amplifier. That 15 volts can turn on the higher voltage switch. The math is a pain sometimes. One NPN output to the base of three 6 amp PNP's should yeild a 24 amp load. Four 20 amp relay's in parallel can handle 80 amps. So you have many routes you can travel. Relays take more time to switch than transistor's. A transistor can have a wide range of power level, the relay is either on or off, not somewhere in between. i would drive some fat solid state relay with that. That is a 3 phase relay, each phase can handle 25A, so you would connect them in parallel to get 75A current throughput. If not, connect as many as necessary in parallel. I am controlling the whole chicken coop with only one nodeMCU, even remotely from anywhere on my mobile. With that unit, you will not only be able to drive/control those SSRs, but also get a feedback and be able to adapt the unit's behavior according to the feedback from PMH. If you would produce your own circuits, i'd say, the costs would be much, much higher. Car alarms the door lock/unlock is a pair of relays. On a negative pulse the door unlocks, a positive pulse it locks. This is where a 555 drives the two relay's. Since he wants a low frequency pulse, relays would work. They just don't last a long time with frequent switching. Always kept a extra relay in the car. Just because the ignition kill relay. That relay malfunctions you're dead in the water. The ignition relay isn't the contacts that go bad, it is the coil holding the latch closed that fails. The flyback is known for killing things. Solid state relay. No mechanical contact. No arc. Can switch at high frequencies. Interesting. So about $15 for both. What does that MCU do?